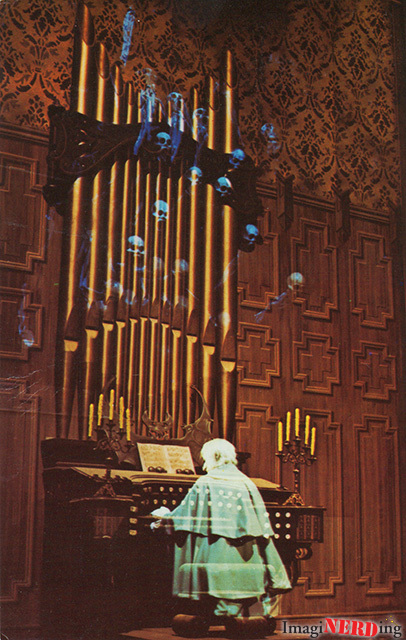 The Haunted Mansion – The Ghostly organist plays a “haunting refrain” in the great banquet hall…one of many “horrifying” sights awaiting visitors inside the Haunted Mansion. I assume the quotation marks are used to soften the fear factor of the ride. Just for fun, here’s the backside of the card, because it’s got some great details. 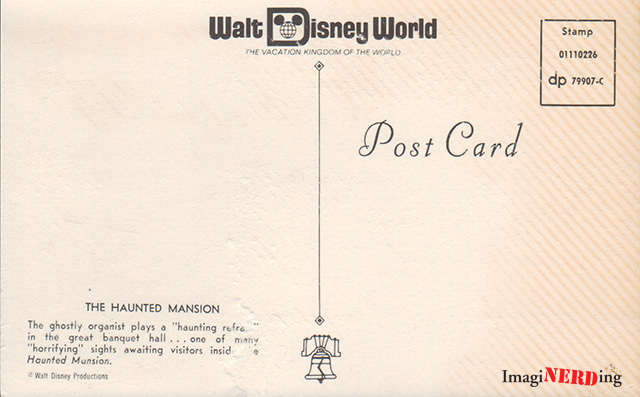 Besides the stylized Walt Disney World and the wonderful Vacation Kingdom of the World, you can see the Liberty Bell that’s at the bottom of the postcard that signifies which land the attraction is in. Marc Davis Book, Vintage Walt Disney World and Communicore Weekly!